A long-legged fly’s eponymous features give it a stable base. 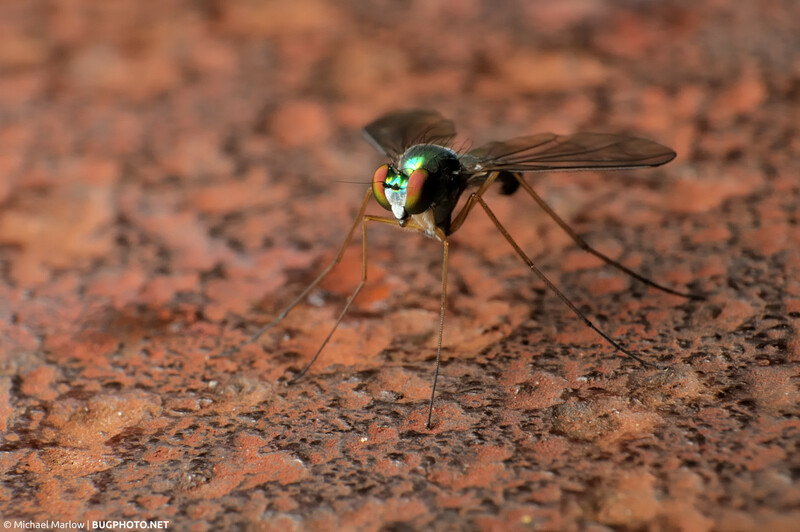 Long-legged flies can be funny subjects (right down to their legs reminding one of a bicycle kickstand). it seems more recently I have been finding members of this family (Dolichopodidae) willing to stay still enough for a (short) series of shots, but more typical in my experience, if they allow you to get close enough (not a given), they “jump” right after the shot is fired. Usually, the big flash in the sky is the offending party with insects, though I’ve wondered if it has anything to do with the shutter. They are fairly common, and not always a top shooting priority, but when they move the spirit (or the lack of other bugs does), I can get some pleasing results and maybe a surprise or two, like the odd but beautiful two-toned eyes on this one. Posted in DipteraTagged Dolichopodidae, fly, harsh glare, Macro Photography, rusty, two-toneBookmark the permalink.